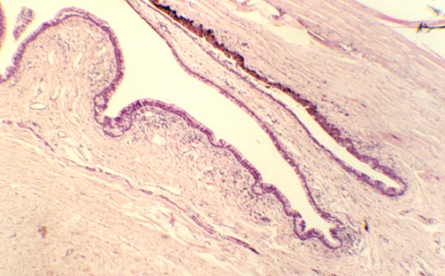 EYELIDS and Lacrimal Glands | Microanatomy Web Atlas | Gwen V. Childs, Ph.D. Hold your slide of the eye up to the light and identify the different regions.Find the lens. That chamber in front of the lens is the ANTERIOR CHAMBER. The chamber beside and behind the lens is the POSTERIOR CHAMBER. It is filled with the VITREOUS BODY. The anterior border of the anterior chamber is the CORNEA. Once you have identified this region, then find the EYELIDS which are anterior to the cornea. 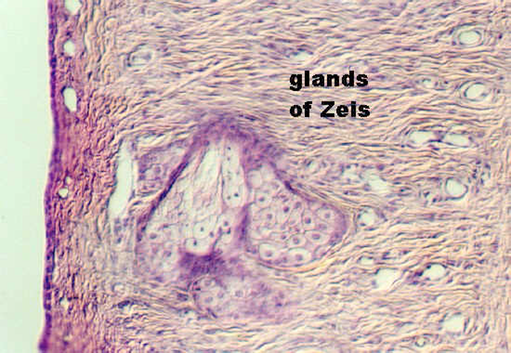 The figure below shows a higher magnification of Meibomian glands emptying into the hair follicle of an eyelash. The small sweat glands in the dermis can be hard to find. They also have a special name. 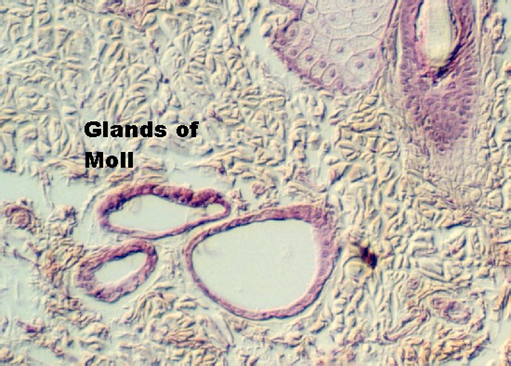 They are called the GLANDS OF MOLL. 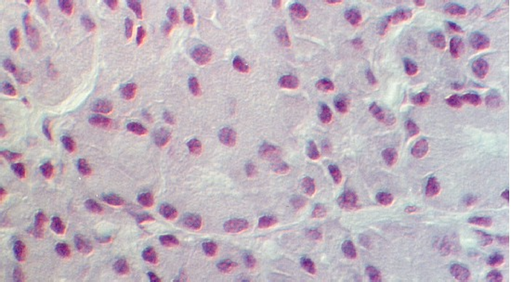 The following photograph illustrates an example near some MEIBOMIAN GLANDS. 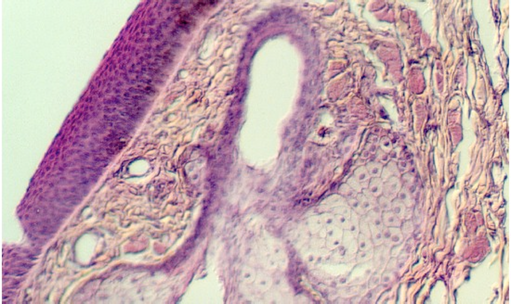 The orbicular muscle is illustrated in the next photograph. It is striated muscle. 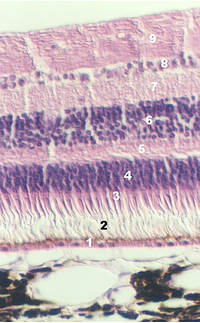 The conjunctiva lines the inside of the eyelids, extending to cover the sclera (bottom left epithelium in following figure). 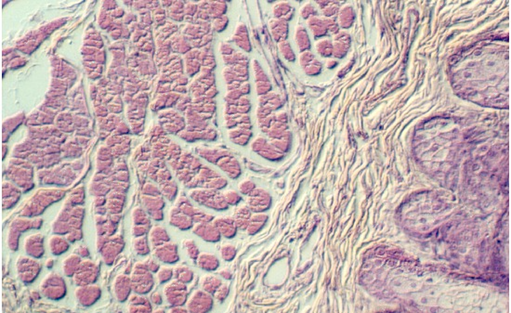 Its epithelium varies from non-keratinized stratified squamous epithelium to stratified cuboidal or columnar epithelium, with Goblet cells. 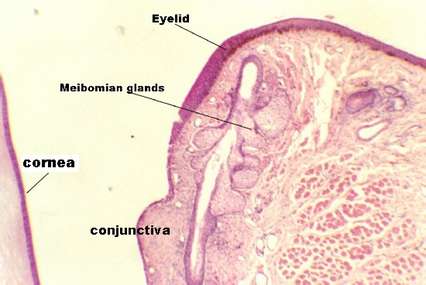 Move to the edge of one of the eyelids and examine the junction at a region called the CONJUNCTIVAL FORNIX. This junction is shown below. The cornea is running along top, upper right hand cornea. The conjunctiva is facing the cornea and distinguished by multiple folds. 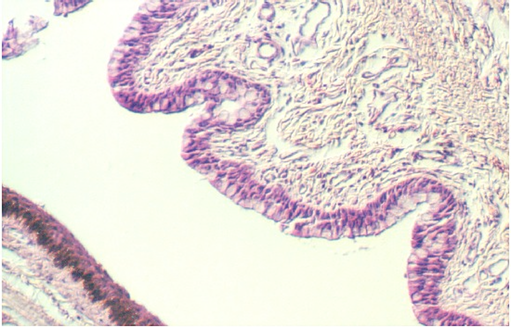 The following figure shows the conjunctiva as a stratified columnar or cuboidal epithelium (top, right) containing numerous Goblet cells. Another source of lubrication for the eye comes from the lacrimal gland (tear gland). The lacrimal gland is a serous gland. It is organized into alveoli, like the parotid gland. 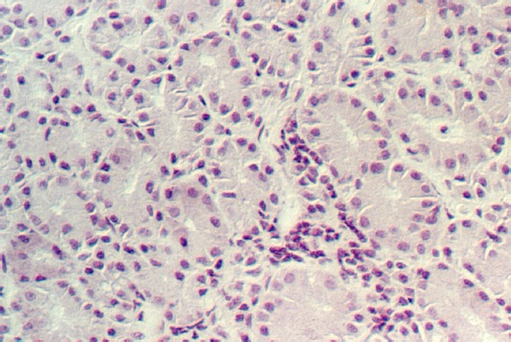 Adipose tissue may be mixed with the glandular cells. 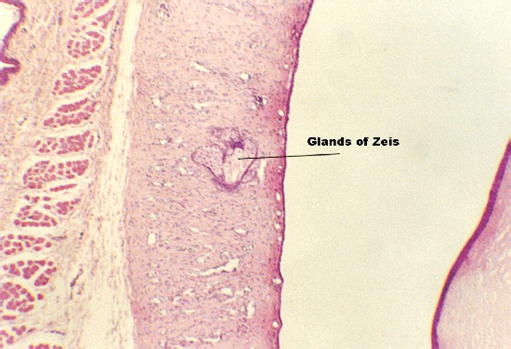 The following illustrations show the gland cells.